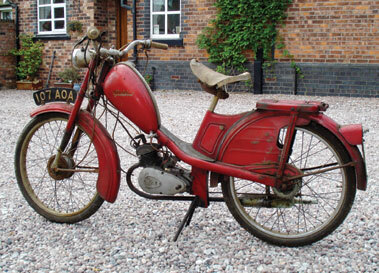 The Phillips moped was cheap at its launch in 1955 but it was not as good a machine as its competitors. It sold for £57 17/- 11d in 1955. 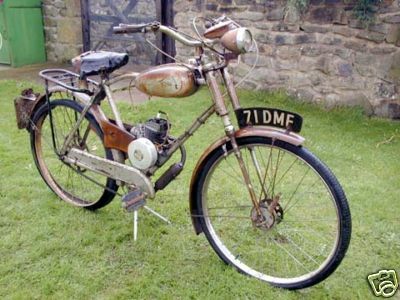 During the 1950s, several cycle makers produced special cycles for fitting cyclemotors to; among them were BSA (including New Hudson and Sunbeam variants), Elswick, Mercury, Phillips, Triumph and Sun. They would be supplied as a complete bike, or missing the rear wheel if a Cyclemaster was to be fitted. Phillips produced a range of such machines. The variations available included lady's or gent's frames, and drum or rim brakes on the front wheel. 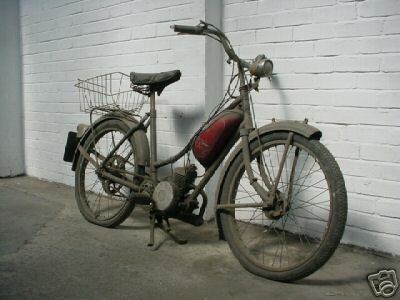 Better known as cycle manufacturer, Philips like Raleigh, recognised the potential of the moped as a natural extension of their product range. The first model was introduced during 1954 as a clip-on power unit and was followed in 1956 by the two speed P39 Gadabout and in 1959 by the single speed P40 Panda and the P50 Gadabout Deluxe with a three speed gearbox. 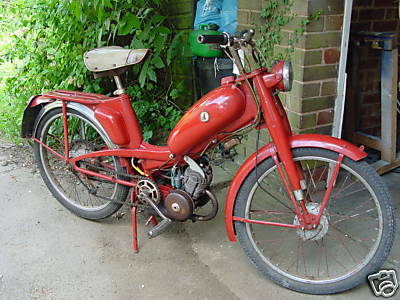 The single-speed Panda Mark 1 & 2 utilised what probably became the last manufacturing installation of the 49cc German Rex cyclemotor engine which first appeared around 1950 in the form of a front mounted belt driven cycle attachment, the strong but basic Panda frame being specifically built to house the motor. The Rex engine at 6:1 compression has no bhp given but carries a 12-millimetre Bing carburettor to the aluminium barrel with sleeve liner in conventional fore & aft porting layout. The crankcase cavity unusually extends all the way to the back of the motor to include lubrication of the reduction gear and its bearings by the induction gases! This results in a reduced scavenge pressure. Mounted on the end of the output shaft with the sprocket inboard, the tiny 2½" Rex dry clutch is a particularly frail pull-operated device and typically responsible for the final demise of most machines. 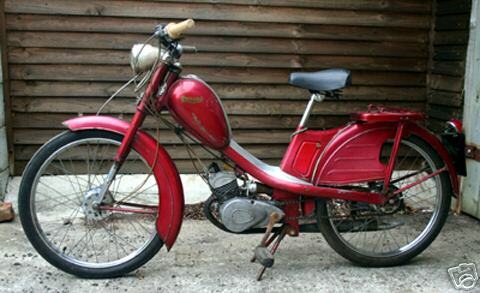 1962 Phillips Panda 49cc Moped The Panda has a 'grip-locking' clutch lever and a carburettor set-up that provides a very reliable and steady tick-over. The rear brake comprises a back pedal Perry Coaster hub and a conventional bicycle-type hub brake, handlebar lever operated for the front brake. 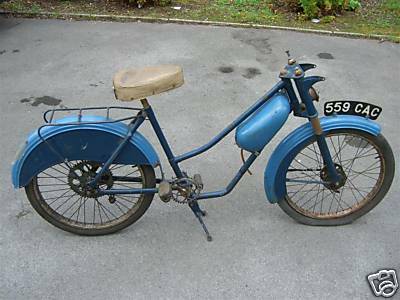 Mark 1 version had no suspension but the mark 2 had telescopic front forks, larger headlamp and deeper valanced rear mudguard but retained the solid rear frame. The electrical system comprised a Miller flywheel magneto with lighting coils. 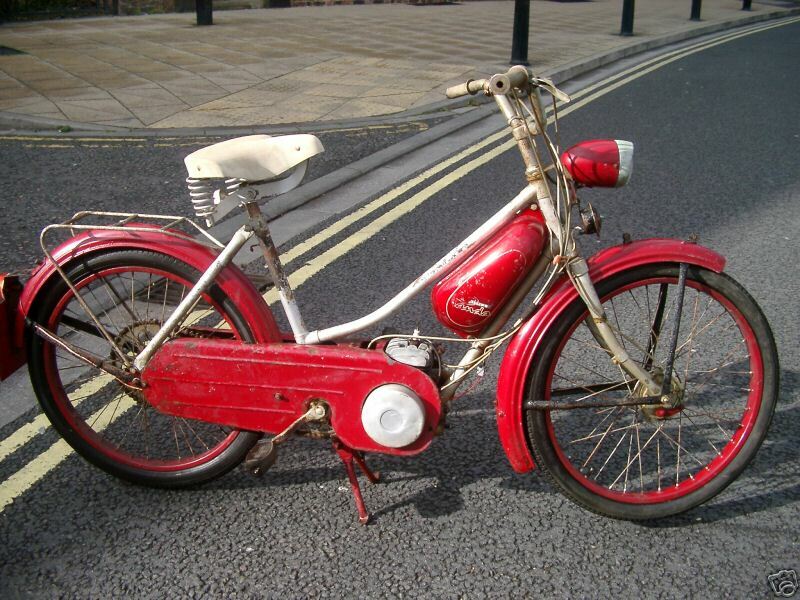 The final Panda mark 3 was simply an imported French Mobylette made by Motobécane badged as a Phillips. It had nothing in common with the previous home-produced models.